Most people think of hip fractures as an injury associated with old age, but this type of injury can occur due to the extreme forces involved in an auto accident. If you've suffered a hip fracture due to someone else's negligence, you may be entitled to personal injury compensation. The possibility of suffering a hip fracture as the result of a car accident depends on the victim's position and where the other car collides with the vehicle. In a T-bone accident, for example, the driver's car collides directly with the victim's hip. Hip fractures are also common in head-on collisions, since the driver typically has his legs extended while trying to slam on the brakes. If the front of the car gets rolled up when it's struck head-on, the force of the impact can travel up the femur and into the hip. X-rays and/or an MRI can be used to confirm a broken hip. Surgery may be necessary if the fracture has been displaced, and the bones are not in position to heal correctly. If this is the case, the surgeon will use pins, screws, or plates to realign the bones for correct healing. Physical therapy is often a vital part of the healing process. This is often recommended for pain relief and to prevent muscle atrophy, but patients with severe breaks may need to relearn how to walk. A number of factors can affect how long it takes a broken hip to heal, including your age, previous physical condition, and the severity of the fracture. 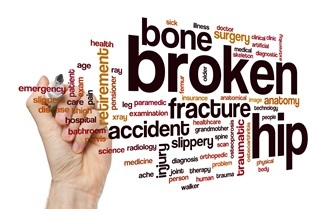 Younger people with simple breaks may heal in two to three months, while older individuals or those who have a severe fracture can require six months to one year or more to heal. For older adults or those who suffer from chronic pre-existing medical conditions, a broken hip can dramatically affect overall quality of life. They may be unable to return to previous living conditions, require increased supervision, have trouble maintaining range of motion, and have a higher risk of secondary fractures in the hip or thigh bones. Personal injury cases are typically settled out of court, but this does not mean it's a good idea to try to handle your case on your own. The at-fault driver's insurance company is worried about protecting its bottom line and doesn’t care about making sure you're fairly compensated for your injuries. You need to have an advocate on your side throughout the process. If you're worried about the potential cost, keep in mind that personal injury attorneys work on a contingency basis. Instead of an upfront fee, your attorney will accept a percentage of the final settlement as payment for representation.